Playoff History: The Canucks and Blackhawks have met twice before in the playoffs, most recently in a 1995 second-round series won by the Blackhawks in a four-game sweep. The first meeting, a 1982 Conference Final won by the Canucks in five games, will forever be remembered as the series that spawned 'Towel Power' in Vancouver. During the second period of Game 2 at Chicago, Canucks head coach Roger Neilson raised a hockey stick covered with a white towel in mock surrender to protest the officiating and was ejected from the game. Canucks fans supported their coach by waving white towels at subsequent home games and a tradition was born. Dreaming of the Conference Finals: The Canucks are vying for their first Conference Finals appearance since 1994, while the Blackhawks look to advance to the final four for the first time since 1995. 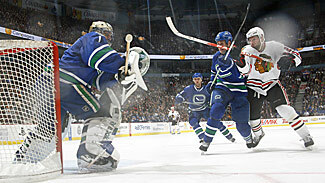 Season Series: The Canucks and Blackhawks split the four-game season series, each winning one game at home and on the road. Goaltender Cristobal Huet won both his starts for the Blackhawks, while teammate Nikolai Khabibulin was winless in two appearances. Roberto Luongo registered both victories for the Canucks. The clubs' most recent meeting, a 4-0 Canucks win at United Center on March 29, was a penalty-filled affair with 98 total minutes assessed. First-Round Recap: The Canucks recorded the first four-game sweep in franchise history in defeating the St. Louis Blues. Three of the four wins were by one goal. Twins Daniel and Henrik Sedin combined for nine points and a +8 rating. Linemate Alex Burrows tallied three times, including the series-clinching overtime winner, and Roberto Luongo led all goaltenders in the first round with a 1.15 goals-against average and .962 save percentage. The Blackhawks posted their first playoff series win since 1996 by upending the Calgary Flames in six games. Forward Martin Havlat lifted the team in the pivotal opening game by scoring the game-tying goal late in the third period and adding the winner just 12 seconds into overtime -- the third-fastest overtime goal in NHL playoff history. Calder Trophy finalist Kris Versteeg led the Blackhawks in scoring (2-5--7). After splitting goaltender duties for most of the season with Cristobal Huet, Nikolai Khabibulin started all six games and posted a 4-2 record with a 2.52 goals-against average and .914 save percentage. Different Season Trajectories: Losers of eight straight in January and left for finished by most, the Canucks rallied to go 23-7-2 over their final 32 games and not only make the playoffs but erase the Calgary lead in the Northwest Division that appeared insurmountable. The Blackhawks, meanwhile, were 19 games over .500 by Feb. 21 (34-15-8) and held the Western Conference's #4 seed for all but four days through the end of the season. B.C. Connections in Chicago: Four players on the Blackhawks' roster -- defenseman Brent Seabrook (Richmond) and forwards Troy Brouwer (Vancouver), Colin Fraser (Surrey) and Andrew Ladd (Maple Ridge) -- were born in British Columbia. In addition, Blackhawks general manager Dale Tallon was the Canucks' first-ever draft pick, in 1970. Tallon cracked the Canucks' lineup for their inaugural season of 1970-71 and represented the club at the NHL All-Star Game in each of the two following seasons before being traded to the Blackhawks in May, 1973. Sunshine State Reunion for Khabibulin, Luongo: Goaltenders Nikolai Khabibulin of the Chicago Blackhawks and Roberto Luongo of the Vancouver Canucks were the number one goaltenders for the Southeast Division and intrastate rival Tampa Bay Lightning and Florida Panthers, respectively, from 2001-02 through 2003-04. In their 12 games facing each other over that three-year span, Khabibulin was 6-3-3 with a 2.53 GAA and .913 save percentage while Luongo was 3-6-2 with a 2.65 GAA and .920 save percentage. Khabibulin-Luongo, Part II: What else do these goaltenders have in common? Try outstanding career playoff statistics. Khabibulin enters the series with a 2.29 goals-against average and .921 save percentage in 63 post-season appearances (35-27), while Luongo counters with a 1.63 GAA and .946 save percentage in 16 games (9-7). Twins Daniel and Henrik Sedin finished 1-2 in team scoring for the third consecutive season in 2008-09, each tallying 82 points (Daniel 31-51--82, Henrik 22-60--82). Henrik ranked eighth in the League in assists. In March they both surpassed the previous franchise high for points in a calendar month, combining for 37; Henrik recorded 7-12--19, Daniel had 5-13--18. The Canucks are 178-58-25 when the Sedins each record a point. One of the NHL's most sought-after free agents in recent years, C Mats Sundin signed with the Canucks on Dec. 18. He made his debut with the club Jan. 7 and went on to record 28 points (nine goals, 19 assists) in 41 games. Sundin ranks among the NHL's top 25 all-time in goals (T-20th, 564) and points (25th, 1,349). G Roberto Luongo missed eight weeks from mid-November to mid-January with a groin injury but still managed to collect 33 wins and nine shutouts, the latter ranking second in the League. The Canucks captain set a career shutout sequence mark by going 242:36 without allowing a goal from Nov. 2-12. The streak was the League's longest since Brian Boucher set the modern NHL record (332:01) in the 2003-04 season. This year marks Luongo's second career playoff appearance. On Apr. 11, 2007 he made among the most spectacular post-season debuts in NHL history by stopping 72 of an NHL-record 76 shots in a 5-4 win over Dallas that was decided the fourth overtime period. Luongo faced the most shots in an NHL game since the League started recording the statistic in 1956. He ended the 2007 playoffs with a 1.77 goals-against average and .941 save percentage in 12 games. Oct. 31: In a highly unusual way for Vancouver goaltender Roberto Luongo to celebrate his 500th career game, the Canucks outscored the Anaheim Ducks 7-6 in a game that was decided in the 13th shootout round. The Canucks led 5-2 and 6-5 before Anaheim's Corey Perry tallied his fifth point of the game to tie the score with less than a minute to play in regulation. Luongo blocked 12 of 13 shootout attempts to post the win. Feb. 3: The Canucks ended an eight-game winless streak (0-5-3) and nine-game skid on home ice (0-6-3) with a 4-3 victory over the Carolina Hurricanes. Canucks forward Alex Burrows scored the game-winning goal on a shorthanded breakaway with 1:22 remaining to end the Canucks' slide. Goaltender Roberto Luongo posted his first win in six tries since returning from a groin injury. The win marked the start of a franchise-record 11-game home winning streak. Feb. 17: The Canucks earned a dramatic late win against division rival Calgary, defeating the Flames 4-3 in a shootout at Pengrowth Saddledome. Vancouver defenseman Kevin Bieksa tied game at 19:09 of the third period with goaltender Roberto Luongo on the bench for an extra attacker and Pavol Demitra tallied the only shootout goal for the win. Luongo and Calgary's Miikka Kiprusoff combined for 78 saves. Jan. 7: Signed as a free agent in late December, center Mats Sundin made his long-anticipated Canucks debut in a 4-2 victory at Vancouver. Sundin, his playing first his first game in nine months, did not record a point or shot in 15 minutes of ice time but the Canucks were sparked by two goals in 12 seconds from Steve Bernier late the second period. Feb. 21: In an ending suitable for a Hollywood script, Mats Sundin scored the game-winning shootout goal in an emotional homecoming to Toronto, where over 13 seasons he had forged among the greatest careers in Maple Leafs history. After being selected First Star in the Canucks' 3-2 victory, Sundin returned to the ice amid a thunderous ovation from the fans at Air Canada Centre. Mar. 4: Acquired C Samuel Pahlsson, D Logan Stephenson and a conditional pick in the 2009 Entry Draft from Anaheim for D James Wisniewski and C Petri Kontiola. Chicago’s 46 wins and 104 points are the team’s most since 1992-93 (47 wins, 106 points). The team reached the 100-point mark for the first time since 1992-93 and improved by 16 points from a year ago when their 88-point total left them three points shy of a playoff berth. The Blackhawks are the League's only team to improve on its record in each of the past four seasons --- 59 points in 2003-04; 65 points in 2005-06; 71 points in 2006-07; 88 points in 2007-08 and 104 points in 2008-09. The Blackhawks' rebuild started less than two months after their last playoff appearance in 2002 when they selected Duncan Keith in the second round of the 2002 Draft (54th overall). Since that time their Draft choice from their present day roster have also included: Adam Burish: 2002, 282nd overall; Brent Seabrook: 2003, 14th overall; Dustin Byfuglien: 2003, 245th overall; Cam Barker: 2004, 3rd overall; Dave Bolland: 2004, 34th overall; Troy Brouwer: 2004, 214th overall; Niklas Hjalmarsson: 2005, 108th overall; Jonathan Toews: 2006, 3rd overall; and Patrick Kane: 2007, 1st overall. The Blackhawks are back in the playoffs for the first time since 2002 and are making their second post-season appearance in the past 11 years. A great deal of the Blackhawks success this season can be attributed to their play on the road -- they tied a franchise record with 22 road wins and had a 22-15-4 record away from the United Center. Last season, the Blackhawks posted a 17-18-6 mark on the road. The Blackhawks ranked fifth in the League with a 2.51 team goals-against average in 2008-09 ... they finished 20th in the league with a 2.82 average last season. The Blackhawks tied for fourth in the League with an average of 3.22 goals per game this season after finishing 10th in the league in 2007-08 with an average of 2.85 goals per game. C Jonathan Toews was named the 34th captain in Blackhawks history on July 17, making him the third-youngest player to earn that distinction in League history. Toews, who turned 21 on Apr. 29, is the second youngest captain to lead a team in the Stanley Cup playoffs (after Pittsburgh's Sidney Crosby). G Nikolai Khabibulin posted a 25-8-7 record this season, marking the 10th time in his 13-year NHL career that he has reached the 20-victory plateau. He ranked fourth among NHL goaltenders with a 2.33 goals-against average. RW Martin Havlat led the Blackhawks with 48 assists and 77 points -- both career highs -- and ranked second on the club with 29 goals and a personal-best +29 rating. Head coach Joel Quenneville posted a 45-22-11 mark since being named the 37th bench boss in Blackhawks history on Oct. 16. Oct. 19: The Blackhawks recorded their first win under new head coach Joel Quenneville with a 4-2 victory over the Vancouver Canucks at United Center. Quenneville was hired Oct. 15 and made his debut behind the bench in a 4-3 shootout loss to the St. Louis Blues the following night. Nov. 22: Dave Bolland scored the winning goal in overtime as the Blackhawks overcame 3-0 and 4-2 deficits to defeat the Toronto Maple Leafs 5-4 at Air Canada Centre. The goal and the win were extra special for the Toronto native Bolland, who was playing in front of more than 50 friends and family on the night the home side honored Maple Leaf legend Wendel Clark. Dec. 16: The Blackhawks continued their surge on a Western Conference road trip by handing the Edmonton Oilers a 9-2 defeat -- the most goals Edmonton has surrendered since a 9-4 loss to Los Angeles on Dec. 28, 1992. Chicago went 4-for-5 on the power play in winning a fifth consecutive game, their longest streak since 2001-02. Dec. 28: The Blackhawks set a franchise record by recording their ninth consecutive victory, a 4-1 decision over the Minnesota Wild at Xcel Energy Center. The club surpassed the mark of eight consecutive victories set in December 1971 and matched in January 1981. Blackhawks forward Dustin Byfuglien enjoyed a career night, figuring in all four goals (two goals, two assists). Apr. 3: Captain Jonathan Toews scored the game-winning goal -- his team-leading 32nd of the season -- as the Blackhawks defeated the Nashville Predators 3-1 to clinch their first Stanley Cup Playoff berth since 2001-02.